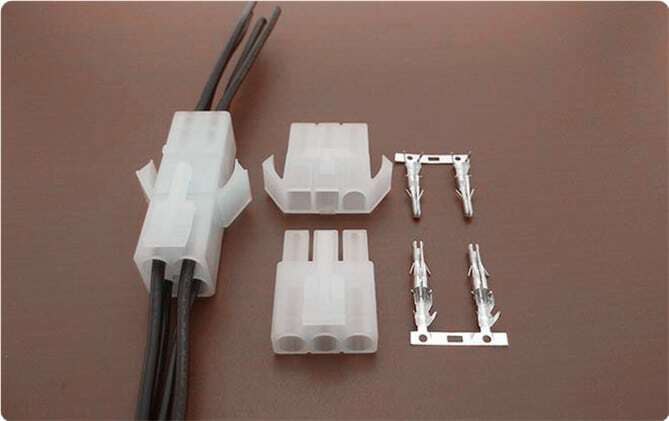 SCT6200 Series are compatible with JST L6.2mm pitch series wire to wire connectors. Scondar offers SCT6200 Series as replacement and cheaper alternative of JST L6.2mm pitch wire-to-wire connector in a complete package including the male housing, female/receptacle housing, female terminal and male terminal, all manufactured with precision-fitting and durability ensuring accurate mating. JST L6.2mm pitch connector supports up to a maximum 10A of current per circuit allowing quick swapping of wired terminals for disruption-free operations in consumer, automotive and industrial applications. Scondar’s economy power connectors are designed with up to 15 positions, so your product can reliably deliver power even when space is limited. These identifiers ensure that there is a correct order in inserting/pairing crimped leads to the circuits. The JST L6.2mm pitch series can also be easily mounted on panels of various thickness without using tools and fasteners. In addition, the simple push-in feature and anti-rattle panel gasket of this wire-to-wire connector enables easy and convenient panel mounting. JST L is one of the most commonly used connectors in power transmission. You can expect that your wire-to-wire connector package is undisturbed during the trip and has maintained its vitality even during your production stages, which is why a lot of our customers has raved about our product for both cheaply-priced and, at the same time, resembles the JST L6.2mm pitch wire-to-wire product in performance and quality.